If youve always wanted to try scuba diving  heres your chance. Join us for the opportunity to finally see what you've been missing. Breathe underwater in a fun, convenient introductory session conducted in the in-store heated pool at our location in Eagan, Minnesota. After a PADI Discover Scuba Diving briefing, you and your instructor put on your scuba gear and the adventure begins. This is only the start of a life long journey of excitement and exploration in the underwater world. Your Discover Scuba Diving adventure will give you an idea of what to expect in the PADI Open Water Diver certification course. To Discover Scuba, you must be at least 10 years old and complete the PADI Discover Scuba Diving Participant Booklet (which includes a brief medical questionnaire). This can be picked up at our location in Eagan, MN and completed prior to your session. If you answer yes to any of the medical history questions, we must require a signed physicians approval before you participate. You can download and review the PADI Medical Statement here. Please print a copy to take to your physician for their approval and signature if required. Pick up a Discover Scuba Diving Participant Statement at either Scuba Center location. Course Fee: $39.95 -- includes use of all scuba equipment. 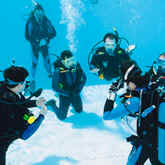 Discover Scuba Diving is not certification. 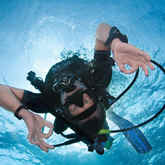 While not a scuba certification course, Discover Scuba Diving is a quick and easy introduction to what it is like to explore the underwater world.